There was never a time when Jesus was separated from His Father. Does that surprise you? If you understand what you were taught about the atonement, it probably does, like it did me when I first saw this. I’ve been making the point in the last few posts that we’ve embraced a theology in the West that creates a conflicted Godhead– thus, we’ve become conflicted in our view of the Father and Jesus. And we can lay the blame for this confusion squarely in our faulty view of the atonement. As I wrote about here and here, our Reformation forefathers have projected their worldly ideas of punitive justice and a pagan-influenced need for appeasement onto God and, thus, have left us the legacy of a schizophrenic Deity–amiable, approachable “Dr.Jekyll” Jesus and a scary and distant “Mr. Hyde” Father. And while these contradictions are subtle, they are devastating to how we view our relationship to Him. After all, you’re not going to run into the arms of Mr.Hyde. In this regard, I will continue my evangelical myth-busters series by talking about the idea of the Father having to abandon Jesus when He took our sin on the cross. This entrenched fable is right up there with God not being able to even look at sin, which I will cover tomorrow. Now, I can fully understand that having a picture of Jesus being forsaken by everyone–even His Father–creates heart-felt sentimentalities that make us cry and love Jesus all the more. But in a much deeper and darker place in our soul, it also makes us wonder about a good Father who would abandon His Child…under any circumstances. Yes, He was laid in darkness, but did Heaven actually look away? I’ll take it a step further. The Father did not look away–actually, He was IN Christ reconciling us to Himself when WE looked away. So, where was the Father? IN CHRIST, reconciling us to Himself. Okay, you may be thinking about now, what about Jesus quoting the beginning of Psalm 22…“Eloi, Eloi, lama sabachthani?” (Mark 15:34). Yes, He did…but why was He quoting it? We must understand that whenever someone quoted one line of Scripture in their religious culture, the audience would understand it in the context of the whole passage. The New Testament writers did this all the time. They didn’t turn Scripture into refrigerator verse platitudes like we like to do. Did you see that? It’s saying that God has not hidden His face from Jesus, nor has He abhorred Him so much that He was deaf to His affliction. So then, what was Jesus doing here? Jesus was identifying with our orphan heart–our feelings of abandonment and separation from God. WE are the ones who viewed Him stricken by God (Isa.53:4). It was our grief, our sorrow that He took upon Himself. It was not His, for He and His Father were always and forever in intimate union, which is critically important for us to see (John 17:21-26). In that light, let’s drive one last coffin nail into this evangelical myth, shall we? 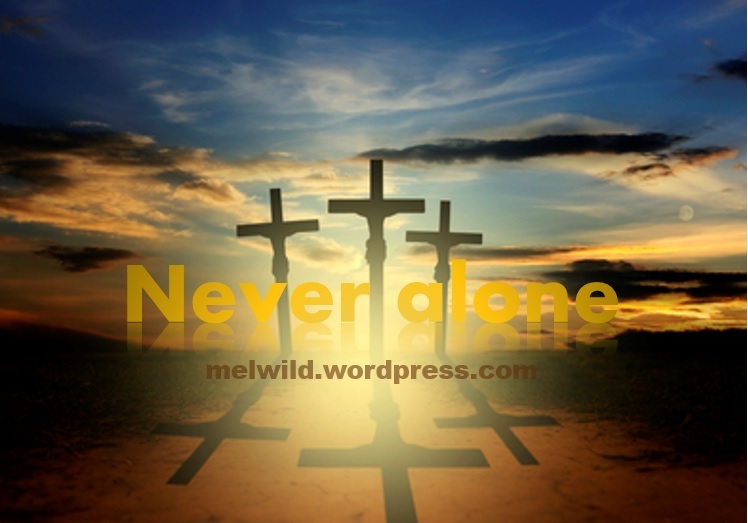 Jesus was never alone, neither are you! and will leave Me alone. We are the ones who saw Him abandoned, we are the ones who turned away…everyone one of us. But the Father was always with Him. Okay, what do the statements, “He who sent me is with Me“ and “The Father has not left me alone“ usually mean to you? Do you see it yet? Jesus leaves no doubt here–He did nothing of Himself. And, again, Paul affirmed it by telling us that the Father was IN Christ reconciling the world to Himself on the Cross. Beloved child of God, your heavenly Father is not an absentee Dad. He won’t run off on you…ever. He never left Jesus in His hour of greatest pain, and He will never ever, ever forsake you either. And He’s not Mr.Hyde, He’s Mr. Love! This entry was posted in Father Heart of God, Theology and tagged abandonment, atonement, Christianity, Evangelical Myth-busters, Evangelical myths, God's love, Jesus, Trinity. Bookmark the permalink. Unlocking the Word… Good job, bro! Amen! I’ve had just been learning about how Penal Substitution is a wrong theology. I think God is opening our eyes to these things. I recently shared along these lines in a message and a woman came up to me afterward who said she had always struggled with God. She also said she had deep father wounds growing up and realized she attributed a lot of that to how she saw God. But when she heard these things about God as a Father, she finally got set free and could feel His love for the first time. Thanks for your comments. Much appreciated. Blessings. I am so happy that we can now understand our Father’s heart at the crusifixion due to Father heart teaching in our time, so blessed to know our Dad and to realise He can’t go against His word. He loves us so much, WOW, it does cause me great pain to think we have misunderstood Him, it must break His heart when people believe He turned away from Their great sacrifice on our behalf, no more, this revelation has given me new life. We can be very glad indeed! The problem in theology is when we reflect our own issues on to God and make it a doctrine. What happens is that we read Scripture through that broken “lens.” We end up projecting on to God our anger, fears, and rejection issues. In this case, creating a very ugly picture of the atonement when, in reality, it’s a very beautiful picture of the Father’s love, in the Son, reconciling His lost and confused children back to Himself (2 Cor.5:19). We find out that God is not like Zeus, as all the pagan religions painted His face in one way or another. He really IS love! And His justice is restorative, not retributive. Thanks for your comments. Much appreciated. Blessings.